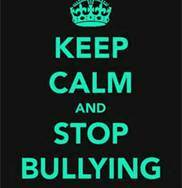 bullying........it's not just for kids. Growing up I dealt with a lot of bullying. I mean a lot. There wasn't to many days that went by that I didn't end up in tears. I didn't respond to it well and had a smart mouth and quick temper which seemed to only make things worse. Little did I know that the adult world has their fair share of them. This week I have had to deal with one in the work place. I am usually really good at keeping a smile on my face and letting anything negative slide off me. That is as long as it happens to me. Be rude to me and it doesn't bother me because you and your actions really don't decide anything in my life, talk about me, that is ok all those years of bullying made me a very very strong person and if you are talking about me then you might be leaving some one who cares what you think alone. The thing that really gets me going though is seeing some one else go through it. That fires me up with a quickness. I guess I just don't understand the thought process of these people..... How is it ok to offend an elderly patient??? How is it ok to refer to some one as an idiot? How are you any better than anyone else? Did the entitlement fairy grant you some power the rest of us are oblivious to? These are questions I would love to ask this person!